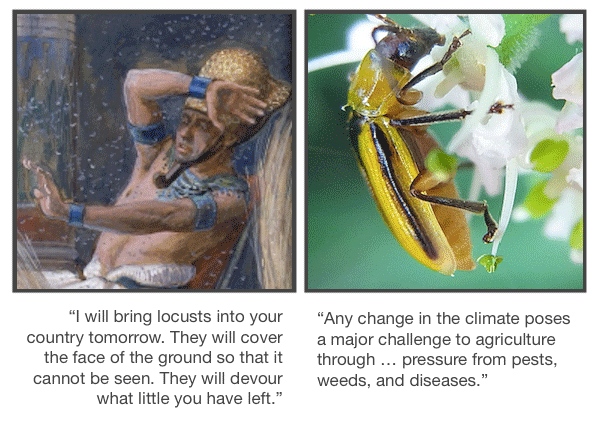 What climate science - and the Book of Exodus - tells us about the future of our food. 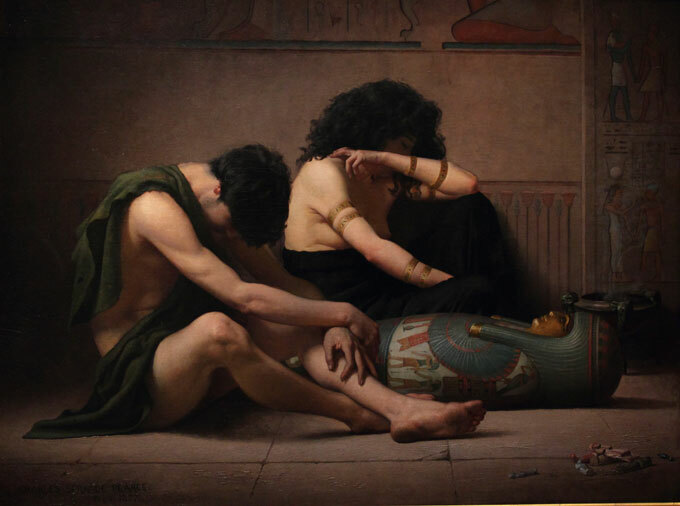 By that point, the Egyptians feared they’d all be killed unless they released the Israelites. Pharaoh summoned Moses, telling him to gather his people and depart from Egypt. In other words, the death of children did motivate action – though not in time to avert a tragedy. Interpret that as you will. It turns out that Exodus’s tenth plague, the death of the firstborn, isn’t the only divine plague with a parallel to climate change. In the past few years, scientists have issued several major reports about the likely effects of climate change on agriculture. Two reports in particular are accessible, highly credible, and offer reason to be hopeful about the future (more on that in a bit). 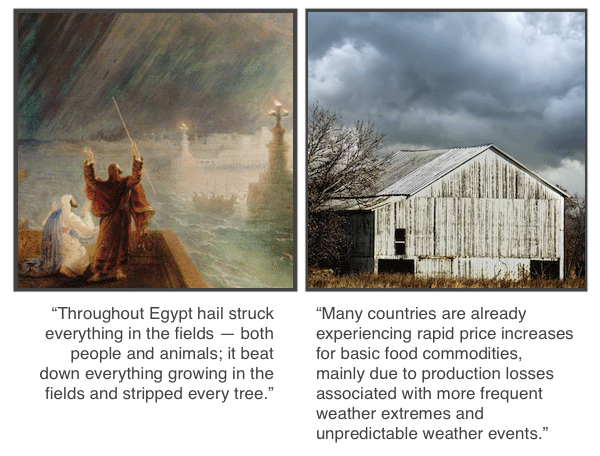 But at times, the climate impacts described in those reports can seem, well, Biblical. 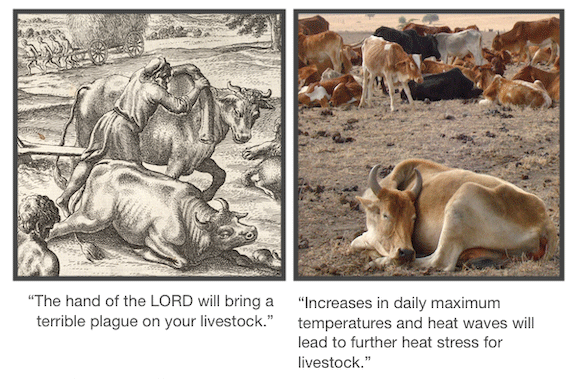 The plague of diseased livestock: Heat waves can make people ill, and they do the same to livestock such as dairy cows. During a recent heat wave in California, cattle died at such rates that they overwhelmed local capacity for disposing of the carcasses. The plagues of insects: In a warmer climate, insect pests, weeds, and agricultural diseases will have the chance to invade territory that previously was too cold for them. The plague of extreme weather: Scientists expect that as the climate changes, farmers will contend with intensifying floods and droughts. Heat waves will also pose a problem. Plant pollination and seed formation are sensitive to heat extremes, so heat waves that strike during reproductive periods are harmful to food production. Scientists expect yields of major U.S. commodity crops to fall as temperatures rise. A good bet in the near term is that U.S. farmers will take action to protect their businesses. They’ll install efficient irrigation systems to cope with drought. They’ll plant trees and build shade structures to help their cows stay cool. They’ll seek out crop varieties that are better able to withstand heat, disease, and scanty rainfall. In the short run, U.S. agriculture has a large capacity to adapt to climate change, according to the most recent National Climate Assessment. But adaptation doesn’t come free. It’s expensive to install a state-of-the-art irrigation system, to develop new crop varieties, and so on. And if crop yields fall as a result of increased temperatures, economists project that global commodity prices will rise as result — though they’re not sure by how much. Under one worst-case scenario, models suggested a median price increase of 15 percent relative to a world where we’d maintained a 2005 climate. Middle- and upper-class people living in the U.S. would be buffered from a rise in prices, because they spend relatively little of their incomes on food – only about 10 percent. And most of the food dollars Americans do shell out are spent on processing, transporting, and marketing the food, not on the raw ingredients. The upshot is that even if the price of wheat increases, the rise in the price of bread might be so slight that many Americans wouldn’t notice. The people who will notice are those who are already living on the edge. In 2017, about 250,000 U.S. households included children who sometimes went hungry. And outside of the U.S., in countries where people already spend large fractions of their income on food, an increase in food prices is a recipe for hunger, social disruption, and perhaps even famine. So, Rebecca, the answer to your question is that climate change is unlikely to cause widespread hunger in the U.S., at least during the next 30 years. But climate change is a real problem for agriculture, one well worth more attention. And if you’re looking for advice on how to treat people who will go hungry as a result of climate change, I hear that the New Testament has something to say about that. Wondering how climate change could affect you or your loved ones? Send your questions to sara@yaleclimateconnections.org. Questions may be edited for length and clarity.